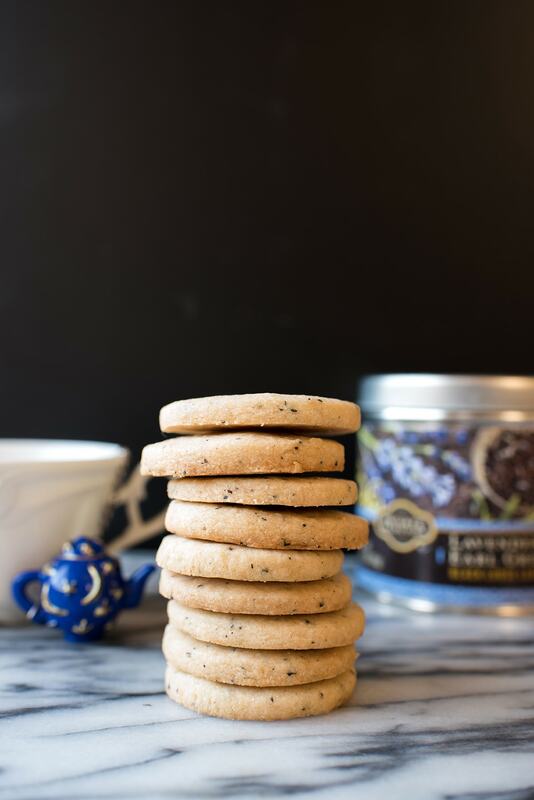 I love a good shortbread cookie and these Lavender Earl Grey Shortbread Cookies are my new favorite! They’re light and buttery and so easy to make. But, like the weather in Los Angeles, it’s impossible to tell what season they fit best! The simple shortbread base feels like Christmas, the cozy earl grey reminds me of Fall, and the lavender makes me think of Spring… and my 8th grade geometry teacher who taught me that you can’t just draw a bunch of fun shapes on your paper and expect to pass. 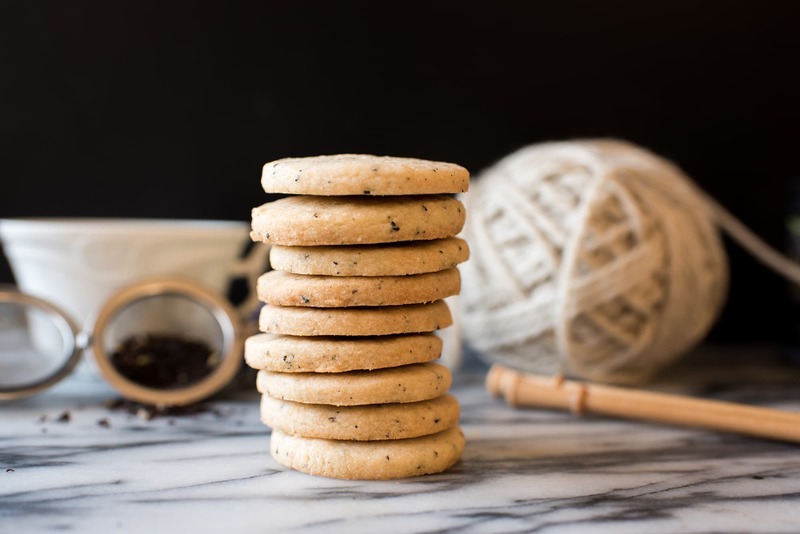 How Do You Make Earl Grey Shortbread Cookies? If you’re a little on the fence about lavender, let me tell you that the Private Selection Lavender Earl Grey loose leaf tea that so good! I love floral flavors, but Earl Grey’s bergamot takes center stage in this blend. Lavender doesn’t entirely wait in the wings, but it isn’t overpowering either. The blend is made from black tea, lavender petals, and all-natural oil of bergamot. It’s simple and delicious. The easiest way to make these Earl Grey shortbread cookies is by using a food processor. Simply add all ingredients except for butter and vanilla and pulse for one minute. Add the butter and vanilla and pulse until it comes together into a shaggy dough. Remove blade, carefully transfer dough onto clean surface, and work dough until it comes together. Shape into two flat discs. Place each on a piece of parchment or wax paper and place in the fridge to chill for 30 minutes. Preheat the oven to 350°F. Always use an oven thermometer to check the actual temperature inside your oven. Mine swore it was 350, but it was actually 425! Roll cookies to ¼” and cut out 1” circles. The shortbread cookies shouldn’t spread, so you can bake up to 16 at a time on a large cookie sheet. Bake cookies for 15 minutes or until edges are just slightly golden brown. Place baking sheet on a cooling rack, let cool, and then enjoy! Earl Grey is a black tea that has been infused with oil of bergamot (a type of orange). Rumor has it that it originated in the mid-1800s when a Chinese tea master created the blend for Charles Grey, Prime Minister of England and the second Earl of Grey. His wife was a fan and requested that her local tea merchants recreate the blend. How Do I Store Earl Grey Tea? Tea experts recommend storing black tea in a cool, dark place in an opaque, airtight container. Just like the one that the Private Selection Lavender Earl Grey comes in! Simply tuck it into the back of your pantry away from spices and other aromatic foods. Can I Freeze the Earl Grey Shortbread Cookie Dough? Yes! Shortbread dough freezes well. If you’re trying to save time before the holidays arrive, make a batch of these and roll them into parchment logs (instead of discs). Place the logs in a freezer-safe resealable bag and store in your freezer. When you’re ready to bake your Earl Grey shortbread cookies, remove the logs from the freezer, let them thaw for a few minutes and create ¼”-wide slices with a sharp knife. Bake at 350°F for 15 minutes or until the edges are light golden brown. Can I Make These Cookies With a Different Flavor of Tea? Sure! You could use the Private Selection Earl Grey tea bags instead to make them without lavender! You can use any leftover tea to make, well, a cup of tea… or a London Fog, which is (my favorite) tea latte made with steamed milk, vanilla syrup, and Earl Grey tea. If you want to amp up the tea flavor, add a second tablespoon of tea to the food processor bowl before pulsing the ingredients together! Before you head to Kroger (or Ralphs, part of the Kroger family of stores), make sure to click here to grab Private Selection digital coupons and save up to $50! 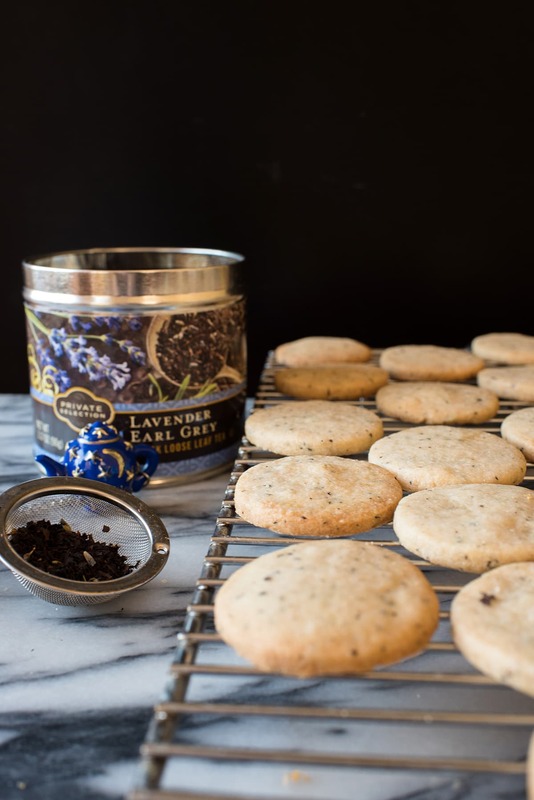 These Lavender Earl Grey Shortbread Cookies are buttery, delicious, and so easy to make. Pulse flour, sugar, tea, and salt together for one minute in bowl of food processor. Add vanilla extract and butter. Pulse until shaggy dough is formed, about two minutes. Remove blade and transfer dough to working surface. Work dough until it comes together and shape into two discs. Place each disc on parchment and transfer to refrigerator for 30 minutes. Roll out dough to ¼” and cut out cookies using 1”-wide cookie cutter. Transfer cookies to baking sheet. Bake for 15 minutes or until edges are a light golden brown. Use an oven thermometer to check your oven temperature before baking. If you do not have an oven thermometer, keep an eye on the first two batches of cookies and remove when the edges are just barely golden brown so they don't burn. Yum!! I love the idea of using tea in these cookies! The lavender is such a nice flavor!